As an introduction to hunting and fishing, I have recently been reading my boys three fun books by Michael and Curtis Waguespack. The two hunting books focus on the pursuit of deer and turkey, while the fishing book looks at catching bass and catfish. As could be expected given the age the books target, the two hunting books don’t include hunting with a firearm but rather hunting with your eyes and learning the habits and habitats displayed and frequented by deer and turkeys. This is a great start to these sporting passions, as learning these basic skills will allow youngsters to eventually build up to an actual hunting scenario with a firearm. 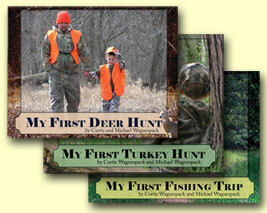 All three books construct a lighthearted look at hunting and fishing and are a pure joy to read with kids. Read these books with your youngsters and get them excited about these outdoor pursuits! !